There are several Gulf Shores happy hour destinations that offer discounted drinks and appetizers daily. 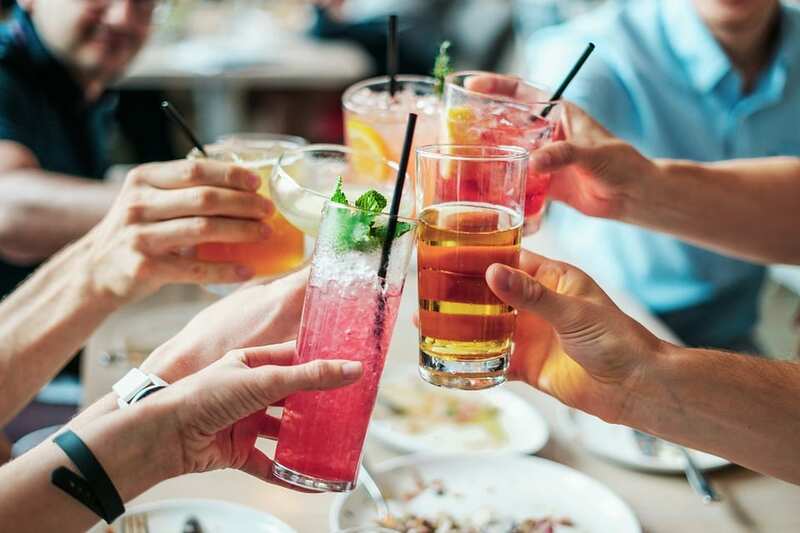 But we’ve rounded up the best happy hour destinations along the Alabama Gulf Coast just for you! 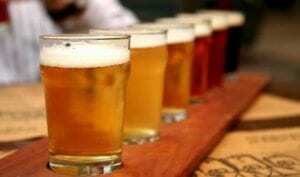 Check out the 5 best Gulf Shores happy hour hot spots below! The Village Hideaway, located onsite at The Beach Club Resort & Spa, has daily happy hour specials from 3 pm until 6 pm daily. The Village Hideaway offers a casual and entertaining dining experience in one of the area’s favorite sports-themed restaurants. happy hour includes drink specials on domestic beers, wine by the glass, and house spirits. Food specials include loaded $7.95 club wraps with soup, tacos, and tender barbecue sandwiches with fries. 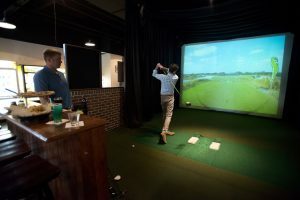 The Village Hideaway has 11 flat screen televisions, an HD golf simulator, and arcade games and billiards. Learn more about The Village Hideaway and see the full menu here. Enjoy fresh bites and cold drinks every day at The Beach House Kitchen & Cocktails. The Beach House specializes in a variety of Gulf seafood and cocktails. From 2 pm to 5 pm every day, The Beach House offers $5 appetizers including fresh, hand-breaded coconut shrimp, wok-seared chicken and veggie spring rolls, and mouthwatering bacon-wrapped shrimp. Take advantage of great drink specials from 2 pm to 6 pm every day including $3 house wines, $1 off all craft drafts, and $1 off all craft cocktails. Enjoy the views from the outdoor porch, just across the street from the emerald waters of the Gulf of Mexico. For more information, call (251) 948-2431. Located just a short drive over in Orange Beach, Luna’s Eat & Drink has several happy hour specials, on top of a menu brimming with mouthwatering options. Served daily from 2 pm to 6 pm, head over to Luna’s Eat & Drink for discounted beers, house wines, beer flights, and well liquors. Hungry? 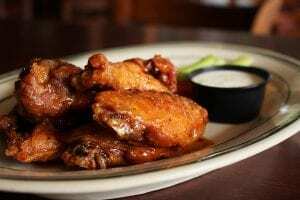 Luna’s serves up delicious bar classics like wings—brined, smoked, and fried—beer cheese dip, and house-fried pork skins. Or try the Pimiento Hushpuppies served with housemade blueberry pepper jelly and the Whisker Nuggets, made from Alabama farm-raised catfish. Call (251) 980-5862 for more information. Voted the People’s Choice Award for Best Raw Oysters, Best Pizza, and Best happy hour, Papa Rocco’s is a can’t miss for great food and drinks in Gulf Shores. Their motto, “The home of warm beer and lousy pizza” is completely inaccurate but that is why it is so catchy and memorable. Happy hour is Monday thru Friday from 11 am until 7 pm that includes discounted draft beers and well drinks. Papa Rocco’s also offers daily lunch specials. Enjoy live entertainment seven nights a week and watch the big game on one of eight HD televisions. You can’t go wrong at Papa Rocco’s! Contact (251) 948-7262 for more information. Located in Orange Beach along Canal Road, Cosmo’s Restaurant & Bar offers a wide range of plates and delicacies including hand-cut steaks, local seafood, pasta, and sushi. Cosmo’s happy hour is daily from 3 pm until 5 pm and includes house favorites like $6 Firecracker Shrimp and $5 Sweet Home Farms Cheese Dip. Enjoy $4 cosmos, $1.50 Yuengling, and $10 off all bottles of wine. And make sure you check out the chalkboard specials located in the bar. Contact (251) 948-9663 for more details. Want more ideas for delicious grub and cold drinks? Check out these Gulf Shores dining options.